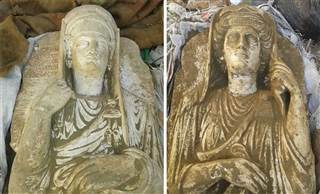 Portable Antiquity Collecting and Heritage Issues: Two Palmyra Busts Traded by ISIL? two never-before-published photographs of Palmyrene statues which were part of a public auction in Raqqa a few weeks ago. The starting price for the statues was $150,000, and ISIS auctions like that have one unbreakable rule: cash upfront. It is not quite clear from this who would be taking part in these auctions as bidders. Are there really foreign dealers going into ISIL-held territory carrying such sums? Or are the auctions for the benefit of local dealers who then will either stockpile them or sell the items on (and then do they pay tax on the profit on top of the purchase price)? There has been quite a bit of discussion of these two on Twitter in the past two days, several people suggesting that the price tag was rather high, even for the two together. Questions were also raised about authenticity, I personally have no opinion here on the basis of what I can see in the photos.The proportions are a bit odd, but that may be the way they were photographed. One observer noted: "the crazy amount of soil on them alone makes me think someone is trying way too hard" and there may be something in that (but see here, for a similar effect there is a lot of dust in Palmyra). There are also a lot of these busts there too, so there is no real reason why somebody would need to sit down and fake one when they are there for the taking (or smashing) by anyone with a long beard and a gun. 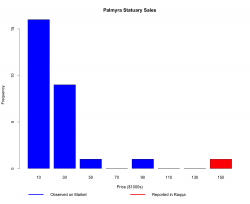 More than three dozen items listed as Palmyrene reliefs have been sold on the open market between 2000 and 2015, based on an analysis of publicly available auction-house data. The highest sale price for such an artifact, from 2008, was roughly $87,000 after adjusting for inflation (see figure below). This analysis is far from complete, and these items vary considerably in size and condition. Market conditions themselves may also have changed. I think that rather than treating this as a proper report we may see this as another of those glib and irresponsible US politically-motivated fairy stories about the ISIL antiquities market which are really hindering those of us who are trying to understand what really is going on. Sam Hardy has done a more thorough examination of the photos supplied by Amr Al-Azm and (Does one of the ‘recently excavated Palmyrene statues’ have six fingers?) pretty convincingly argues that the items are pretty awful fakes. I would like to see Amr Al-Azm's response to the comments that have been made on the information he has supplied. Where did he get this information from, and how did he verify it before passing it on to journalists? Let it be noted that this same academic (see here: 'National Coalition of Syrian Revolution and Opposition Forces Establishes 'Heritage Task Force' PACHI Wednesday, 25 June 2014) is the underlying source for a lot of the notions on which the whole story of ISIL-antiquities-funding is based. That story today lies more and more in tatters as Palmyra shows few signs of the carpet-looting seen on other Syrian sites and the 'evidence' being desperately pulled out of hats like this proves to concern objects of wholly dubious identity and relevance.